Surfing can provide that unique experience to make your Kauai vacation more memorable. While visiting the Hawaiian Islands, you will hear the name “Duke,” which refers to a person and a chain of restaurants named after him. In this specific case, “Duke” is a name and not a title. Duke Kahanamoku lived from 1890 to 1968. He was a man of many talents, a five-time Olympic swimmer, an actor, and a lawyer, and he spent a lot of time traveling the world, sharing the sport of surfing. His Olympic career started in 1912 at Stockholm when he won a gold medal in the 100-meter freestyle competition. At the 1924 Olympics in Paris, he won the silver medal in the 100-meter swimming event behind Johnny Weissmuller, who won the gold. The bronze medal went to Duke’s brother, Samuel. Duke finished up his Olympic run in 1932, playing for the US water polo team. Duke is a Hawaiian legend and known as the father of modern surfing. Through the early 1900s, Duke travelled the globe evangelizing the sport of surfing, with a trip to Australia in 1914 being perhaps his most influential visit as it is credited with introducing the sport to Australia. For those of you itching to go surfing, Kauai has plenty of options to scratch your surfing itch. The North shore is best during the winter months. The south shore is best from May to October. Beginners can hone their skills at Kalapaki Beach, Salt Pond, or Lemon Drops. You can find Kalapaki Beach at the Nawailiwili Harbor. As you are driving towards Lihue on highway 50, turn right on Nawiliwili road (near mile marker 1). Drive about two miles and turn right onto Wa’apa road. You will soon see the harbor on your left. To get to the Salt Pond, head west out of Lihue on highway 50. Drive about 17 miles and turn left onto Lele Road and then take the first right onto Salt Pond Road. Lemon Drops are softer rolling waves just south east of Brenneke Beach. Brenneke is the east-most beach in Poipu Beach Park. For you intermediate surfers, a great spot is PK’s. P.K. stands for Prince Kuhio beach and is next to the Beach House Restaurant. You will find all kinds of ocean activity here and maybe even a sea turtle or a beached seal. The Beach House Restaurant is on the south side of the island at 5022 Lawai Road in Koloa. If you are just starting out, there are many places all over the island where you can take lessons. 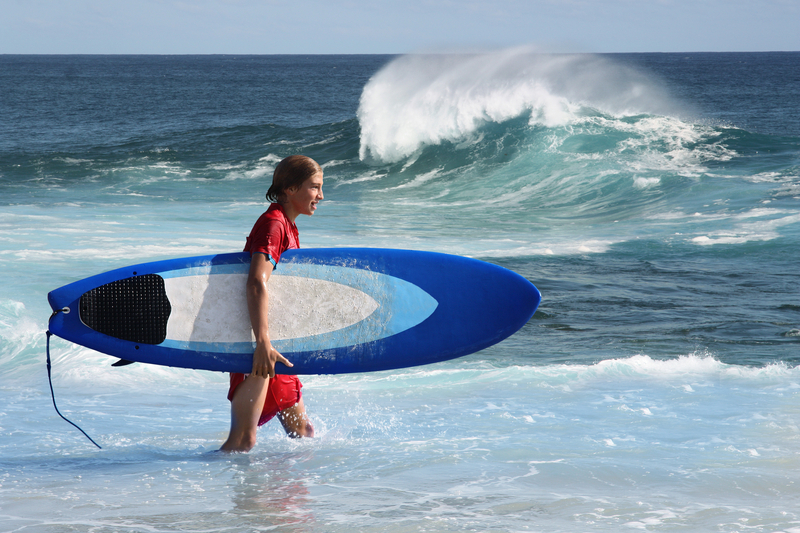 A number of places in Poipu and Hanalei will rent you equipment and provide a two-hour lesson. Many of these places are located such that you can get some on onshore instruction, paddle right out into the surf, and put your learning into practice. One sport that has really gotten big in Hawaii is stand-up paddle surfing (SUP). This is where you stand up on a longer board and paddle around. Lessons are available on the island. The sport really took off in 2005 and you can now see it all over Hawaii.